Angered by the possibility of another transportation project devastating their community, dozens of eastside residents expressed their opposition to a SR-710 North alternative they believe would once again require East Los Angeles to pay a high price for what is a regional problem. “For decades, we have been the dumping grounds for the problems of other communities,” said Clara Solis Saturday during a Metro meeting in East L.A.
“Now we’re being asked once again to sacrifice for the greater good,” she said in disbelief. It soon became clear that the majority of East L.A. residents at the meeting at Griffith Middle School believe the light rail train (LRT) alternative will disrupt a community already divide and surrounded by transportation projects. “East L.A. has taken their burden, they have taken a fair share of projects,” said Jeffrey Hernandez, referring to the 60 (Pomona) 5 (Santa Ana/Golden State) and 710 (Long Beach) freeways and Metro Gold Line that were built to benefit traffic in the region but have splintered the eastside community. Many said they prefer a tunnel over an elevated light rail train that would stay above ground through East L.A., but go underground in more affluent communities, such as South Pasadena, San Marino and La Canada. “While the light rail is being proposed under the guise of a regional solution, the fact is it is nothing more than an irresponsible and unconscionable response to the more influential areas opposing the logical completion of the 710 Freeway,” she told EGP in a statement. A similar statement from Roybal-Allard was read during Saturday’s meeting, drawing loud cheers from residents, heartened to hear an elected official speak so strongly in support of their community. 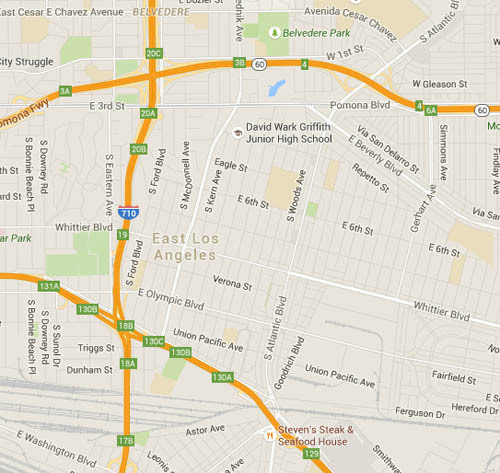 Roybal-Allard represents East Los Angeles and Commerce, also located adjacent to the 710 freeway. The meeting was at times rowdy, as residents and business owners, often speaking loudly and passionately, demanded Metro officials give them a chance to be heard: something they said the agency failed to do during earlier scoping process. When Metro officials refused to allow speakers who had gone over their allotted two minutes to keep speaking, the crowd at times responded angrily. According to the Draft Environmental report, building the light rail would force the removal of 15 businesses. “We in East L.A. have made a sacrifice to relieve traffic, we don’t need another Gold Line,” said Lily Hernandez. “What we need is jobs, we need progress and this alternative is going to hinder that,” Hernandez said. Business owner Tony DeMarco, representing the Whittier Boulevard Merchants Association, said he believed the EIR/EIS process has been flawed since before it was expanded into East L.A.
“It’s kind of like a take it or leave it attitude,” DeMarco said. Many of those who oppose the light rail favor another controversial alternative. “If you’re to give us what we need, give us a tunnel,” David Ibarra said defiantly. However, Mark Lopez of East Yard Communities for Environmental Justice warned attendees not to be so quick to support the tunnel. “East L.A. was so late in the process, [it’s] a tactic used to instigate more support for the tunnel project,” he told EGP. “We need to get back to the scoping, not picking an alternative,” he said. Dr. Tom Williams, a Sierra Club member and El Sereno resident, said he opposes all current alternatives. He said a community group is getting ready to submit yet another community alternative. In May, the cities of Glendale, La Canada Flintridge, Pasadena, Sierra Madre and South Pasadena gave their support to the Beyond the 710 coalition’s “6th alternative,” not in the Draft EIR. On Saturday, County Supervisor Hilda Solis said the community must continue to make sure their voices are heard during the review process. She agreed that more information about the impact to the region is warranted. 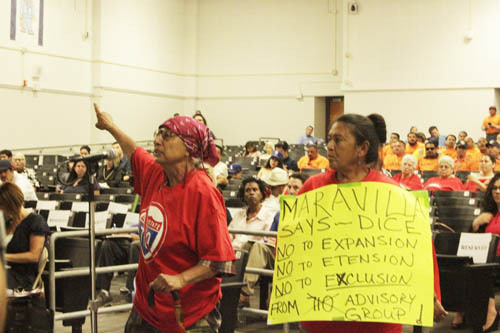 “As I have stated in more than one occasion, I do not believe that the East LA community has enough information about the health impacts of the different options for the 710 N. extension,” she told EGP in an email; stopping short of answering if she agrees with Roybal-Allard that the light rail train is another example of environmental racism. For East L.A. Chamber of Commerce Executive Board Member Eddie Torres, the choice is clear. He says his Chamber, the Whittier Merchants, Maravilla Business Improvement Assoc. and new East Los Angeles Advisory Board all support the tunnel alternative. “We surveyed people leaving the meeting and about 80% said they want the tunnel, not a light rail, he told EGP. “ We’re hearing that Solis says we don’t want either, but that’s not true,” he said. June 25, 2015 Copyright © 2012 Eastern Group Publications, Inc. In addition to the light rail project harming East LA residents, the freeway tunnel alternative also will have negative impacts on resident’s health and increase traffic that passes through the community. It makes sense that more trucks will pass through ELA if they can drive straight through to the I210. The numbers in the report shows more than 900 more vehicles an hour driving on sections of the I710 through ELA during rush hour. This increases cancer risk over the no build. ELA Residents already face higher cancer risk because of pollution. Pollution from freeways causes asthma and other health problems. There is also a link to autism. Health impact studies on ELA are inadequate in the EIR. This project should be redone with input from ELA residents. Where do you get $10 to $20 toll? The EIR says more like $4 to $5. The facts are out there, you don’t have to make them up to bolster your point.